This soup is one of the first things my mother in law ever cooked for me. My husband's family love to eat soups, nearly every day there is some sort of soup served in their house, either a broth or something like this, thick and hearty. When I got married, I watched my mother in law make this and I wrote what she was doing so that I could make this for my husband. As my in laws live abroad I wanted to cook him things his mum made for him. Since then this has been something that I regularly make for my family. My kids love this to, they grew up on this kind of food. 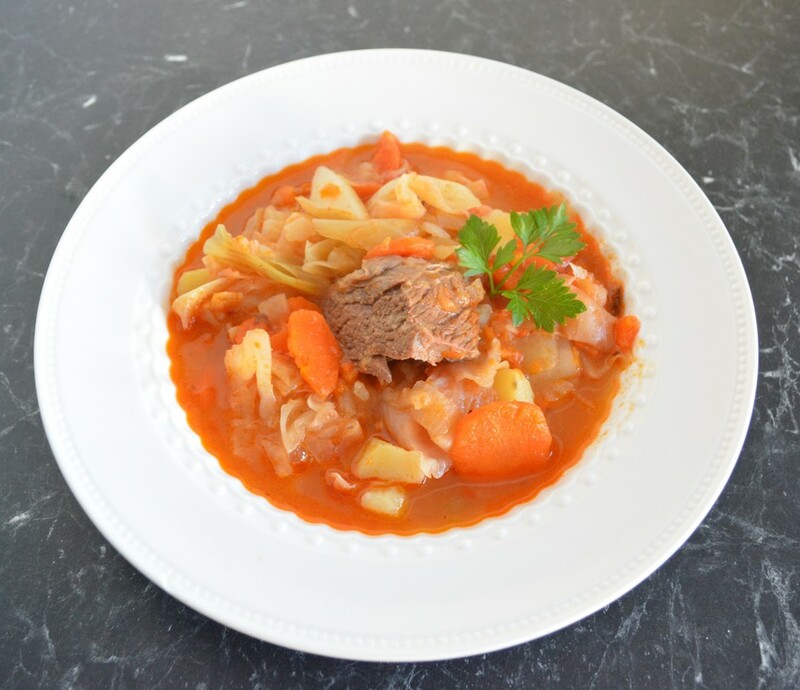 My youngest, when he was 5 years old and in kindergarten, told his teacher (when asked what his favourite food is) he said his favourite food was Cabbage Soup. I'm pretty sure it is not your standard answer for a 5 year old. It still is his favourite. With regards to the meat, you can make it with beef (chuck steak usually, but today I used beef spare ribs) or with pork (spare ribs or chops), either meat is delicious. Ajvar is a Croatian chutney made with capsicums, eggplants and tomatoes. I like to use the Podravka brand, hot or mild. You will need a large pot to cook this, as it makes for one large soup. But when I do cook this, that is it for dinner, as it is quite filling. 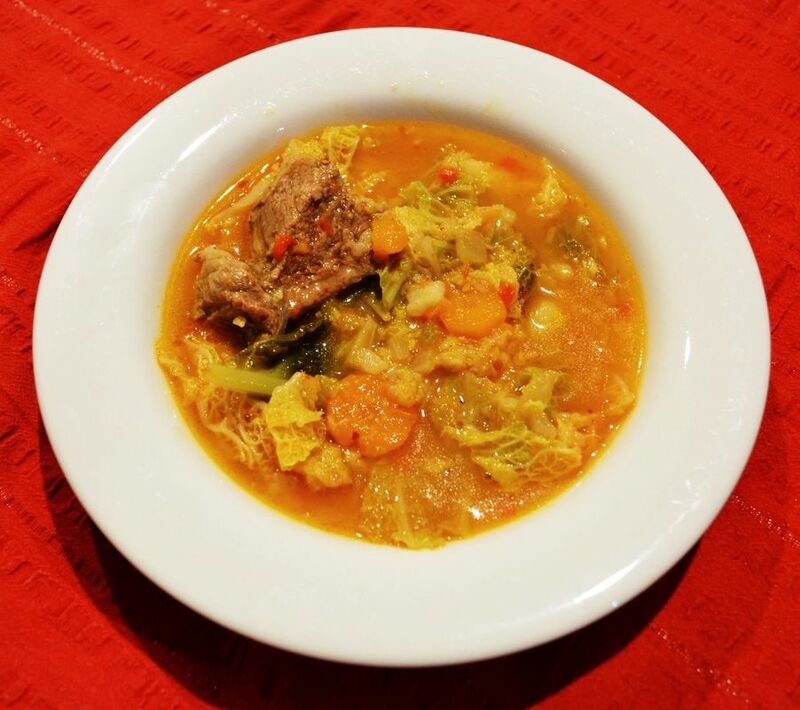 Anyway, if you love cabbage, give this a go, as it is a lovely, thick and hearty soup. Fill up your saucepan half way full with water. Bring to the boil, add all of the chopped up cabbage, bring it back to the boil, cook for 1 minute, then drain and discard water. Set cabbage aside until needed. Again fill up your saucepan half way full with water. Add the meat, bring to the boil, reduce heat and simmer for 10 minutes. Remove any 'scum' that rises to the top of the saucepan. Add the carrots to the saucepan, simmer for 50 minutes. Add the potatoes to the saucepan, simmer for a further 20 minutes. Add the cooked cabbage, simmer for 5 minutes. Make the zaprzak: In a small frying pan add the oil and onion. Sauté over a medium heat until just starting to colour. Add the flour and paprika, stirring constantly, cook for 1-2 minutes (you may need to add a splash more oil if it feels too dry). Add 1-2 cups of cold water to the zaprzak, mix to make it smooth and add it to the saucepan. Add salt, pepper, vegeta, ajvar, chilli sauce (or fresh chillies) and tomato passata, simmer for 20 minutes. After 10 minutes of cooking, taste for seasoning. If it is not spicy enough, add extra chilli flakes until you are happy with the spice. Season if needed. Serve hot with crusty bread.